This is a re-post from earlier this year but it is most relevant now. A crash of steel upon steel, ripped, screaming from forces not meant to be; Main deck, deck plates, deck after deck and into the mud below. A deafening Roar as the torpedo detonates below. The hull rises, falls and lists. 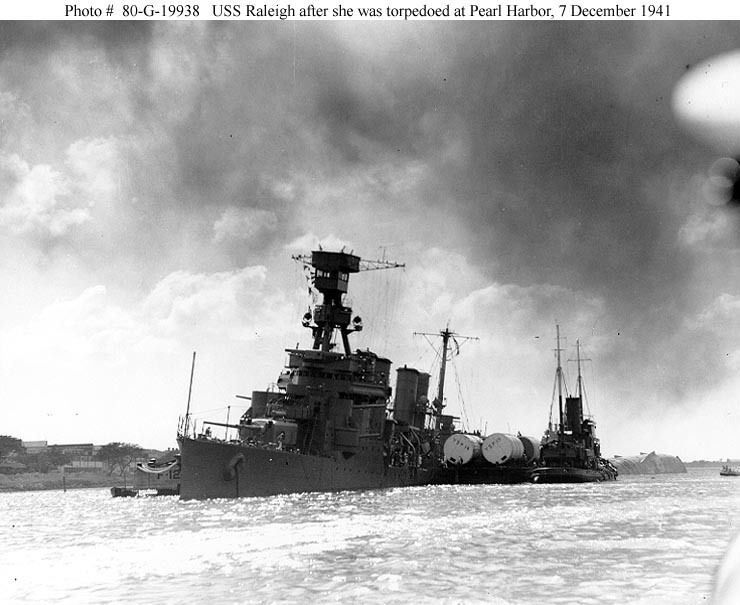 USS Raleigh (CL-7) became an early casualty at Pearl Harbor that Day. Round One. Damage control underway. Gaping holes and torn seams shored for now. Then, impact Two… this time as an armor piercing bomb crashes through bulkheads and explodes a short distance beyond her hull. All survived there but below decks, not a pretty site. The fight goes on. Retrospective- Courageous acts by officers and men saved most souls on board. She was kept afloat by jettisoning everything not permanently attached; barges supported, pumps counter-flooded and breaches were shored. Raleigh made it and survived for the duration. Just one ship that day out of many. Our Navy’s greatest loss for a time. Life and Fight go on. After that we were honored to have dad home again. Peace is won through strength. I heard something about Pearl Harbor the other day –information released in a new book or something. I wasn’t paying attention I guess. But from what I heard it sounded like stuff I’d already heard before. I guess there will long be interest in the “date that will live in infamy” and the rumored or proven conspiracy theories that surround it. Thanks for your comments, Arlee. I’ve heard so much speculation that I’ll not comment on that to a great extent. Seems to me the local commanders took the fall because intelligence wasn’t shared with them in a timely manner. In our family’s case the story is deeply personal and I’ve echoed the words of my dad. A moving, and deeply personal tribute, not just to your father, but as you say- to an entire generation who knew the meaning of courage and sacrifice. What they all did, the forces fighting on land, sea, and air, and all those who battled to support them on the home front, should never be forgotten. God forbid something like this ever happens again, but if it does, I hope whichever generation faces it will find the same courage that these brave men and women did. We owe them all our gratitude, for the comfortable lives and freedoms we enjoy today. T. James, I owe you a debt of gratitude for your thought provoking and generous comments. In the context of the Second World War the ‘here’ was the global theatre of conflict.